← Ledges, Slots and Climbs! Piggy-backing on our cave surveying course, Rod S. had organised a practice weekend at Cliefden Caves so that those of us who had done the course in October could do some “real surveying”. Heather, Beth and I were able to go and Rod joined us with Phil and Luke (rookies / potential surveyors). Surveying guru Bob K from Illawarra Speleos (ISS) and our Orange Speleos (OSS) contact, Bruce made up the rest of the party. Located near Orange in Australia’s heartland (cattle and sheep country), the caves are located on private property and (on behalf of the owners) OSS monitors who can visit them. The caves at Cliefden are well-known because of some “blue” stalactites caused by traces of copper that have leeched into the ground-water feeding the stals. Over the last 3 or 4 years, the caves have been under threat from a proposed dam (which would have flooded a lot of the caves – good news for cave divers but bad news for the rest of the caving community) and the blue stals might have been flooded. 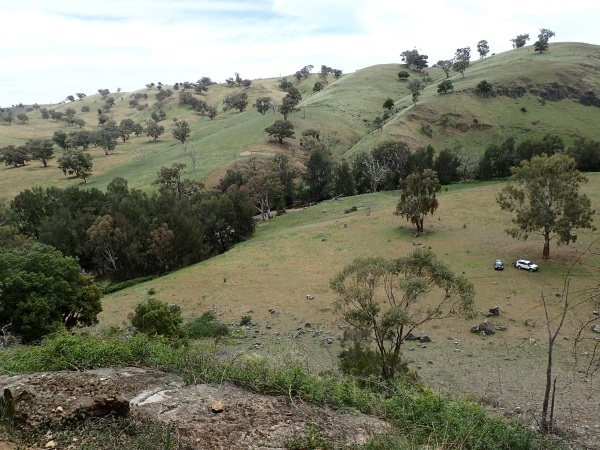 OSS mounted an impressive “save Cliefden Caves” offensive to thwart the proposed dam and the caving community are awaiting news on whether or not the offensive has been successful. 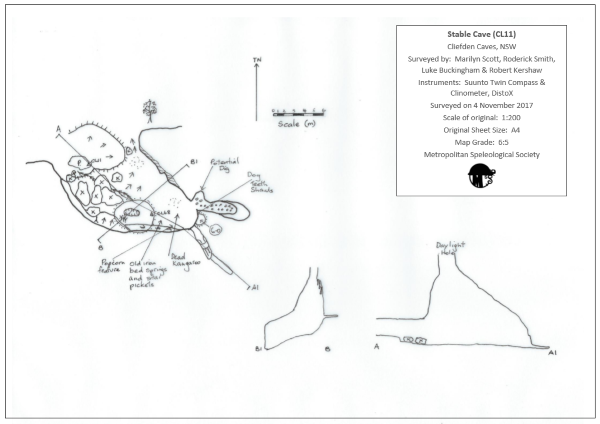 OSS (assisted by SUSS) are now working towards mapping all the caves and Rod had offered our services to assist them with data collection. The land-owners allow OSS to use an old “shearers’ quarters” building, and OSS have done considerable work refurbishing the hut to make it comfortable. There’s nothing better than a hot shower and an open fire after a hard day’s caving! 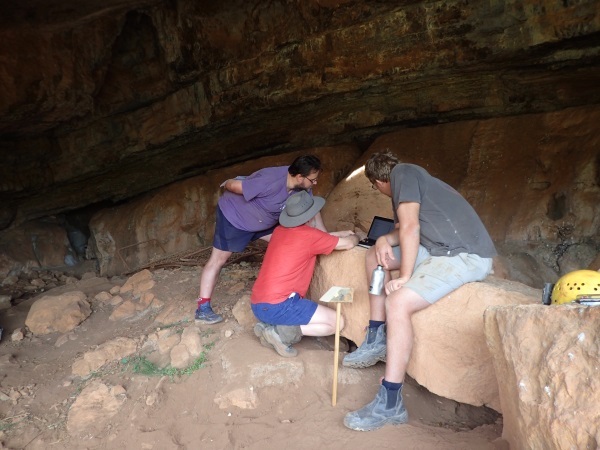 Everyone (except Bruce) arrived on Friday and next morning Bruce turned up bright and early and selected the caves that he wanted surveyed, Stable and Blow Fly. We broke up into teams, Heather, Beth, Phil and Bruce would do Blow Fly and Rod, Luke and I would do Stable, assisted by Bob. Interestingly, Stable Cave came into the limelight in the 1870s when a shepherd was murdered whilst tending his flocks. His money was taken (£1/1/-) and his body was cut in two and thrown down the daylight hole. His murderer subsequently returned to the scene of his crime, was caught, confessed and was hung (UNSWSS SPAR no 39 November 1974 page 11, thanks for the info Bob). Grisly stuff! No evidence of bones other than a dead kangaroo. Before heading off, Bob showed us what was in his “surveying pack”, and showed us how to calibrate the DistoX, you need to do this when moving around Australia because magnetic north changes depending on where you are. He also stressed the importance of redundancy and having back up equipment with you “just in case” (clino and compass). This is the nifty tool used to set up the calibration of the DistoX. To calibrate, the DistoX takes 56 readings and the readings must be done away from any metal (either outside or in a cave is best). You only need to calibrate if you move from state to state or country to country – or sometimes if you change the batteries. 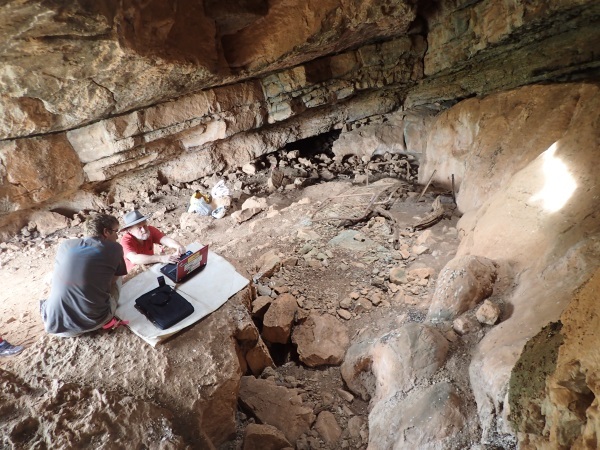 We decided to calibrate Rod’s DistoX inside the cave so we took along Beth’s computer. The DistoX would blue tooth the information to/from the computer. So, we set off on the 20 minute drive to Stable; the others drove off in a different direction. Three cattle gates later, we arrived at the cave and headed up the hill (40m). First things first, take a GPS reading (GPS down by the yellow helmet), and document where the cave tag is, nice paper pointer in Rod’s hand showing cave tag, Bob checking number of satellites his GPS is picking up. Now it’s time to calibrate Rod’s Disto. Problem #1, we didn’t have Beth’s password for her computer. So, without calibration, the Disto is useless. Problem #2, we forgot to pack the clino and compass (doh!). The guys trying to figure out Beth’s password, Rod’s calibration tool set up ready to go in the foreground. So, Bob and I hopped in his car for the 20 min. drive back to the hut (I was along to open/close the cattle gates). The gates were way heavy – they need to either fix the hinges or buy some new ones! Back at the cave with Bob’s computer and the Clino and Compass (just in case). Problem #3, Bob’s computer wouldn’t talk to Rod’s DistoX. Luke and Bob trying to figure out why Bob’s computer wouldn’t talk to the Disto. In the middle on the right, laying on the ground beside the wall, an old metal bed> Looks like this cave has been used in years gone by for a shelter for shepherds. By now it’s around mid-day and we haven’t even taken a reading! So, we broke out the Clino and Compass and started taking some measurements (we could use Rod’s Disto for measuring length but not the compass settings). It was slow going; we stopped for lunch at 2pm and walked down to the vehicles. The view from the cave entrance, “miles and miles of bloody Australia” as the saying goes. The river is where the line of trees are. If the dam had gone ahead, all the lower ground would have been under water, the cave would have probably been above the high water mark but it would have been difficult to get to! While we were finishing up lunch, the others arrived to see how we were going, they’d already finished their initial data collection and a rough drawing of the map. Eureka, they let us use their Disto, so we climbed the hill again and, just to be on the safe side, re-measured the angles and bearings (the ones with the clino and compass were slightly off). Another great pano shot by Luke, me doing more sketching and Bob and Rod having a chat. As you can see the cave’s not very big, and we were always in daylight. Problem #4 for me was avoiding the dead kangaroo on the floor of the cave, it was a big one and everywhere I wanted to go, the bloody carcass was in the way! Rod in a little side section, looked like someone had “dug it out” a little, we needed to measure how far in it went. Great shot by Luke looking out the cave entrance to the countryside beyond. By 5pm I was brain dead, I had been drawing and writing down data points since 11am, so was really pleased when everyone decided we’d had enough. Back at the hut, after a hot shower and a glass of wine, I was ready to input the data to our surveying program. Problem #5, heaps of errors, took ages for us to figure out where the problem was, and then Problem #6 we didn’t have a printer to print off our cave skeleton. However, we were able to get around the printer problem and were back to drawing. Lots of wine later and I’d had enough and hit the sack. 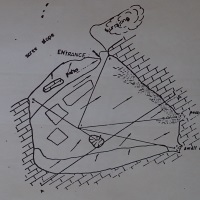 My map, scale 1:200 – up in the thumbnail at the start of the blog, you can see part of a map drawn up in 1969, they would have used a bushwalkers compass and a fabric tape measure, amazing what we can do with technology these days! take heaps of photos to refresh your memory when you’re drawing up the map. Thank you so much to Bob K, so helpful and generous in sharing information and knowledge, bit thanks too to Luke and Rod for their patience as I sat there drawing! 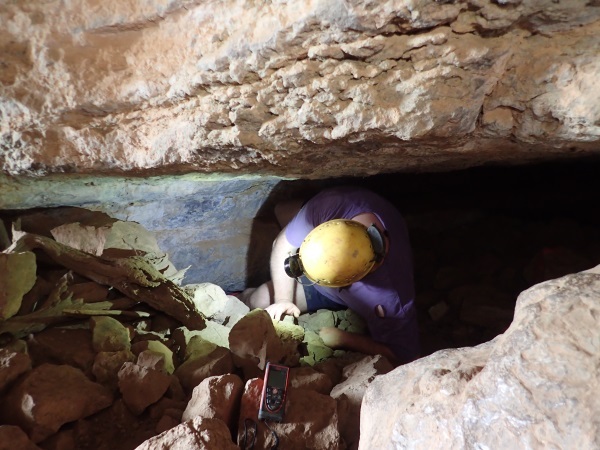 Despite our hiccups (well, our team’s problems, the others just had a difficult cave to survey which is a whole other story), we’re all still keen about cave surveying/mapping, and we’ve now got a plan as to what we want to achieve, so, watch this space! 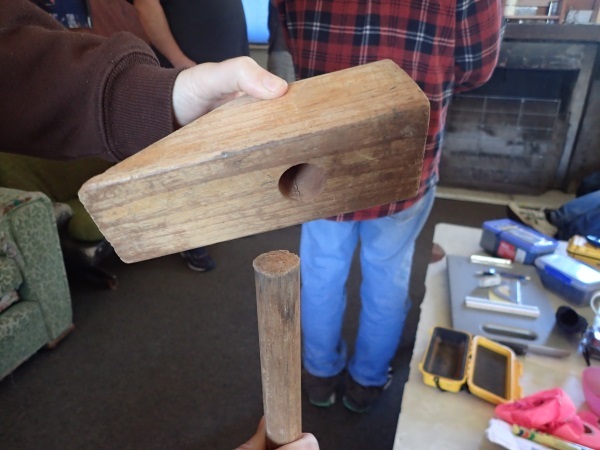 It’s really cool, you just put the tool on the block of wood, turn it on its axis 4 times, then go to the other levels (horizontal, vertical, 45 degrees you get the idea). 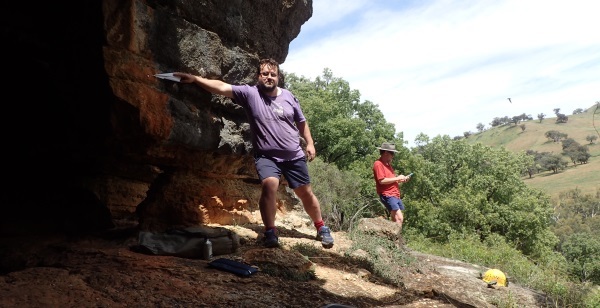 When I get my Disto, you can help me calibrate it … oh yes, you have to go in a cave for that but I recon I could get you in last weekend’s cave, big and open more like an overhang. Hi Eric, yes, my new hobby!